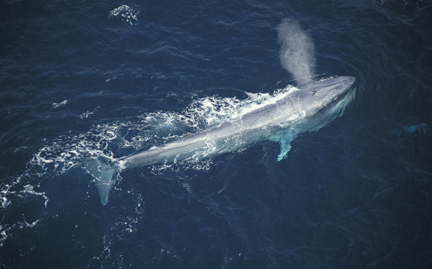 Blue whales inhabit the open seas in all oceans from the tropics to the poles. The largest animals ever to have lived on earth, these giants can grow over 100 feet in length and weigh more than 150 tons. Blue whales were nearly hunted to extinction before commercial whaling was banned. Today, there are 10,000 to 25,000 blue whales. Blue whales are at risk from pollution, ship strikes and bycatch.